Cambodia's government will host the start of a three-day celebration marking the 20-year anniversary of the end of civil war. The event, beginning Dec. 29, is designed to lay to rest the issue of when the long-running conflict finally ended. Tens of thousands are expected to gather in Chroy Changvar, the peninsula that fronts the capital, dividing the Mekong River and Tonle Sap, to mark the war's end — known as "win-win." They will also mark the opening of a memorial that the government says will "tell the next generation the real history of Cambodia." On Dec. 29, 1998, Cambodia's 30-year war ended when surviving Khmer Rouge leaders Nuon Chea and Khieu Samphan formally surrendered to Prime Minister Hun Sen at his compound on the outskirts of Phnom Penh. "Win-win policy allows Cambodia to attain peace and territorial unity and that it brought about socioeconomic development and poverty reduction, particularly as Cambodian people no longer died in war as in the past," Hun Sen recently said. FILE - Former Khmer Rouge leaders Khieu Samphan, left, and Nuon Chea sit together during funeral services for Khieu Ponnary, the first wife of Khmer Rouge leader Pol Pot, in the former Khmer Rouge stronghold of Pailin, northwestern Cambodia, July 3, 2003. The capitulation came seven years after the 1991 Paris Peace Accords were signed and the end of the war declared; however, the arrival of peacekeepers with the United Nations Transitional Authority in Cambodia (UNTAC) in 1992 failed to disarm the Khmer Rouge. As a result, the fighting, kidnappings and terrorist attacks continued with three armies loyal to Khmer Rouge leader Pol Pot, and to the two prime ministers who shared power — Hun Sen of the Cambodian People's Party (CPP) and Prince Norodom Ranariddh of the Funcinpec party — squaring off against each other. According to CPP honorary chairman Heng Samrin, that changed in 1997 when Ranariddh sought a deal with the Khmer Rouge. He wanted to forge a military alliance in an effort to outgun Hun Sen, who responded accordingly. Hundreds were killed and Ranariddh was routed. Amnesties in return for defections were offered to the Khmer Rouge as government troops loyal to Hun Sen made a final push into their last strongholds along the Thai border and forced a final surrender. In the book The People's Struggle, Cambodia Reborn, recently released to coincide with the celebrations, author Heng Samrin credits Hun Sen with ending the conflict which began with a Khmer Rouge call to arms in August 1968. "In extinguishing the fire of war — something the U.N. was unable to achieve — Cambodians and observers from other countries expressed admiration for the tactics of the CPP leaders," he wrote. Peter Starr, English language editor of Cambodia Reborn, said the U.N. and the Paris Peace Accords contributed much to Cambodia's development. "Heng Samrin acknowledges the U.N.'s important role in helping to resettle hundreds of thousands of refugees along the Thai border and supervising multi-party elections in 1993. But he also sets the record straight by explaining that the U.N. did not end the civil war — that would take another five years." Cambodia's two decades of peace have been anything but trouble-free. A border dispute with Thailand turned to armed conflict in 2008 and Hun Sen accused a variety of insurgents of attempting to undermine his administration, including the Cambodian Freedom Fighters, Islamic militants and a recent color revolution. Political violence is not uncommon, while land-grabbing and corruption rankle as chief complaints. At elections in July, Cambodia was again returned to a one-party state after Hun Sen banned the main opposition party from contesting the poll. But among ordinary Cambodians, the security that came with peace opened this country up to the outside world, and delivered unprecedented economic growth and a post-war baby boom. "After the war ends, everything is going smoothly, people live peacefully, the country is developing, kids can go to school and people have jobs," said 24-year-old waitress Hean Khea. Her sentiments were echoed by Raksmey El, also 24 and a recent university graduate, who was mindful of the problems experienced by Cambodia amid two decades of peace, particularly with regard to corruption and elections. "I hope that this peace and this political stability will keep improving from today on," he said. "Nowadays we can see that we have more development in our Cambodia, bringing more foreign direct investment, and especially we can see the tourism sector is dramatically increasing every year. "However there are still some problems, for example the corruption, which should be completely eliminated by the government." 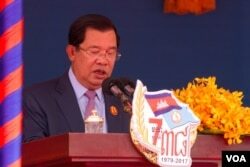 The government has insisted the three-day "win-win" celebrations are not a snub to the Paris Peace Accords, which also injected $2 billion into Cambodia's struggling economy, but is simply an acknowledgment that civil war lasted 30 years and that its final end was orchestrated by Hun Sen and not the United Nations.